Thank you to all our hardworking fans for making the 2018 Quaker State 400 presented by Walmart a success. The Quaker State 400 returns to NASCAR in 2019. But the Quaker State 400 isn't just a test of toughness––it's a celebration of those who love speed. NASCAR boasts some of the sporting world's most dedicated fans and our race is for them. 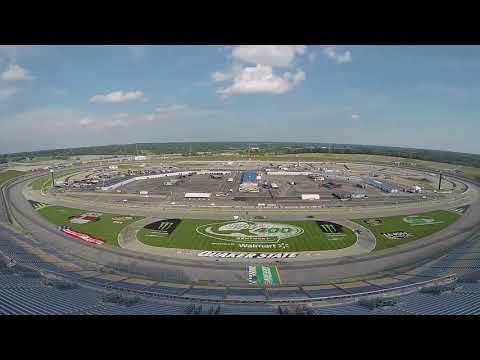 Each year we bring NASCAR fans a behind-the-scenes look at all the action on the track, so whether you're sitting with us in the stands or watching from home, strap in for Kentucky Speedway’s stampede of horsepower: the Quaker State 400. Check out this year’s Quaker State logo being painted in the field before the big race. Joe Ray of Lowrider Magazine talks shop at the Quaker State Pit Stop. Jimmy Houston is all smiles at the 2018 Quaker State 400. Joe Ray of Lowrider Magazine, Tommy Pike of Tommy Pike Customs and FLW Anglers Scott Canterbury, Jimmy Houston and Matt Arey pose with the Quaker State 400 life-size trophy. Fans got to go head to head in the Quaker State Oil Change Challenge competition. Our prize wheel for Quaker State swag was a hit! Fans put their skills to the test in the Good Year Quaker State Pit Crew Challenge. The Walmart Auto Care Center lounge by the Tommy Pike Customs trailer was a great place to cool off. Time for a photo op at the Walmart show car. The FLW tour boat wasn’t like a fish out of water at the Quaker State Pit Stop! The Shell-Quaker State team helped Martin Truex celebrate his big win at the 2018 QS400.